for a "What Changed" Ear Training Game and am challenging them to change up their own pieces this week using Variation Cards so they can play a variation for me at their next lesson. Simple Variations on a Circle Artwork - I thought this would make a great attention-getting activity as students arrived. Students color circles to create various objects. The circle is the common "Theme" and the fillings are the "Variations". Variations in music will look and sound different but they all keep a common element. More Complex Twinkle Variations Artwork - One of the most famous Theme and Variations pieces is Mozart's Twelve Variations on "Ah, vous dirai - je maman" aka Twinkle Twinkle Little Star. 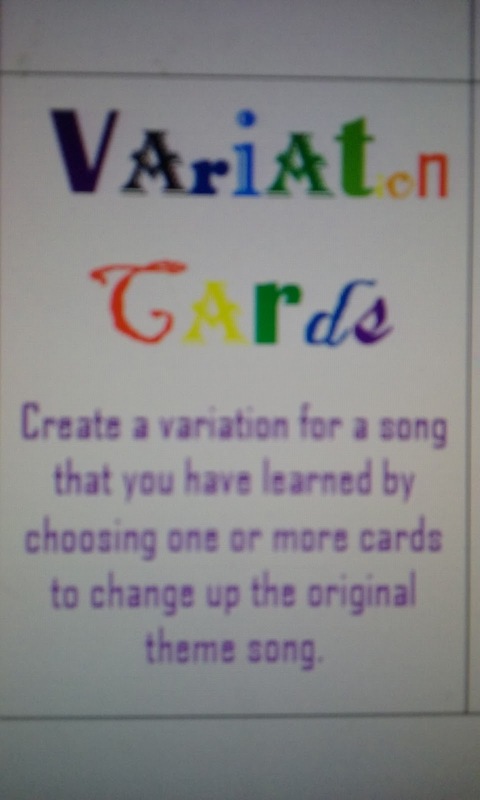 I chose creative names to represent the qualities in the music in each variation and will have students listen to the variation and draw their own representation of the variations in stars. This youtube video makes the melodic and harmonic style variations easier to spot. Then we will discuss different ways to create variations in music. Rhythm Cups Theme and Variations- For a more complex variation including fun rhythm movements watch this cups rhythm theme. LR Conversation = Alternate the melody between the Left and Right hands so it sounds like they are having a conversation. Round 1: Students first play a matching game to match the pictures to their description cards to become familiar with variation options. Teacher or student plays an example when they find a match. Round 2: Teacher plays short variation samples of a familiar tune and students race to slap the matching card. If you make multiple card sets, students can arrange 9 cards bingo style and cover the card they heard if you prefer a less physically competitive option. Practice Challenge: Choose one of your piano pieces as the "theme" and create a variation by picking one or more variation cards to change up the theme song.